Whether you are about to tackle your first DIY project, or you are looking to upgrade your essential toolbox, a circular saw is in your future. After all, with a hammer, power drill, and screwdriver set you can get most household and even professional tasks accomplished. For instance, a circular saw is what you will need if doing some flooring, cutting sheetrock, building a doghouse, or attempting any number of creative projects. Because of this, a circular saw is a must-have item. Designed to cut straight lines with a circular saw blade that spins at amazing speed, you’ll find them in a number of different styles including sidewinder (inline), worm drive or hypoid. You’ll find them as cordless styles, too. Easy to use, they are loaded with safety features and tools to help you get the best results. Below, we’ve listed 11 of the very best circular saws on the market. We’ll go over each of them, looking at pros and cons, and then share a few bits of important information on selecting the circular saw that is best for your specific needs. Keep in mind that these circular saw reviews are just a brief itemization of the standout features of the individual saws. You’ll want to go online (using the URLs provided) to see each for yourself. DEWALT DCS391B Circular Saw Sidewinder 6-1/2” Check on Amazon! 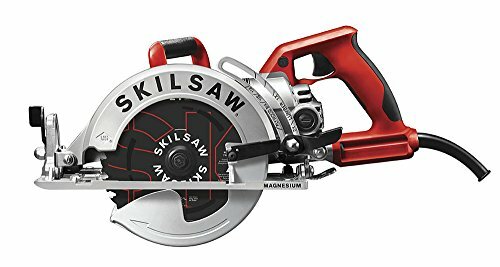 SKILSAW SPT77WML- Circular Saw Worm Drive 7-1/4″ Check on Amazon! 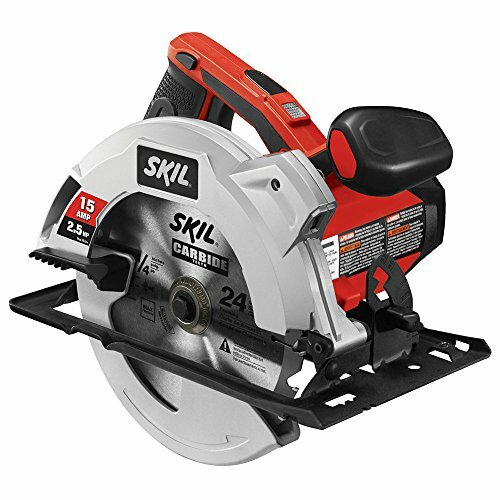 Skil 5280-01 Circular Saw Sidewinder 7-1/4″ Check on Amazon! 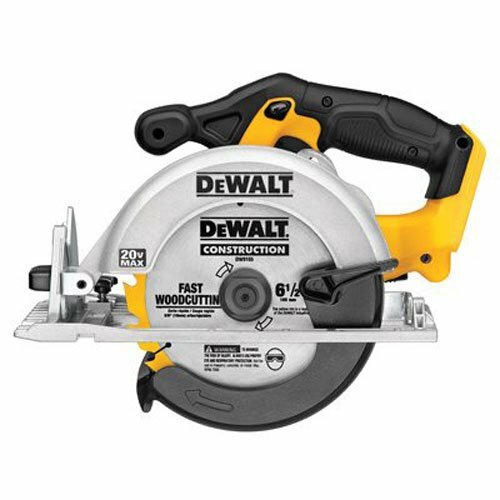 DEWALT DWE575SB Circular Saw Sidewinder 7-1/4″ Check on Amazon! 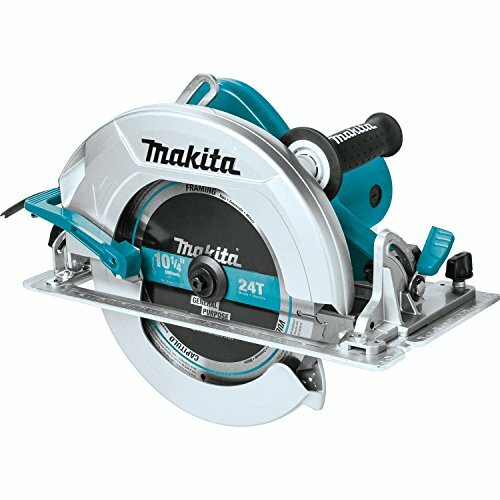 Makita 5477NB Circular Saw Hypoid 7-1/4″ Check on Amazon! 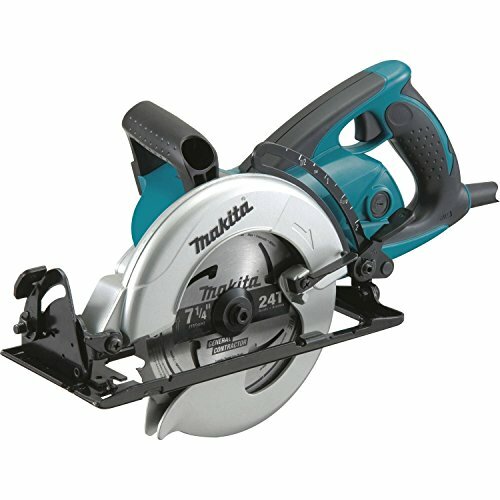 Makita 5007F Circular Saw Sidewinder 7-1/4″ Check on Amazon! TACKLIFE TCS115A Circular Saw Mini 4-3/4″ & 4-1/2” Check on Amazon! 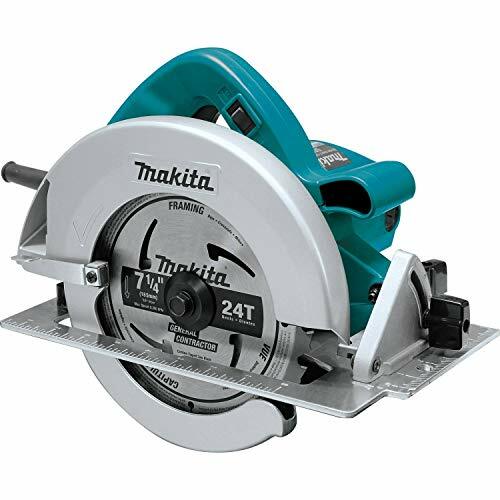 Makita HS0600 Circular Saw Sidewinder 10-1/4″ Check on Amazon! 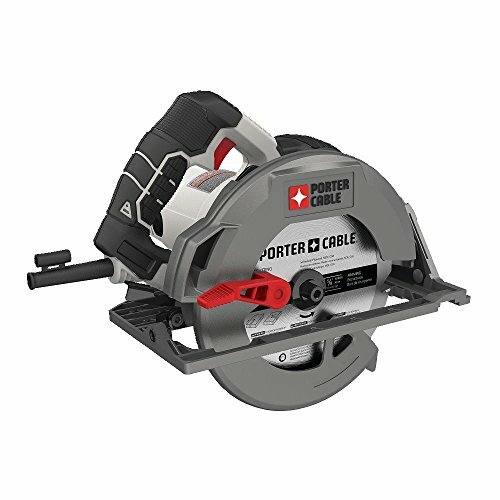 PORTER-CABLE PCE310 Circular Saw Sidewinder 7-1/4″ Check on Amazon! 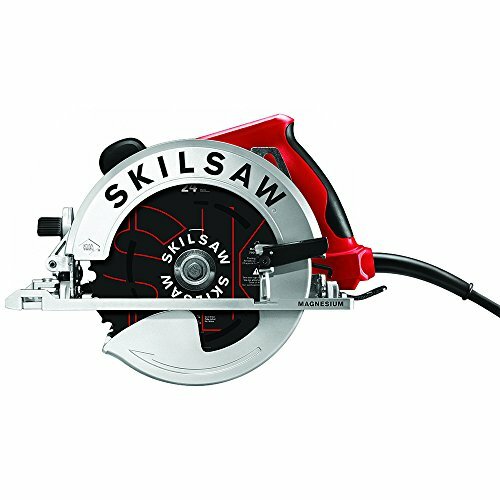 SKILSAW SOUTHPAW SPT67M8-01 Circular Saw Sidewinder 7-1/4″ Check on Amazon! 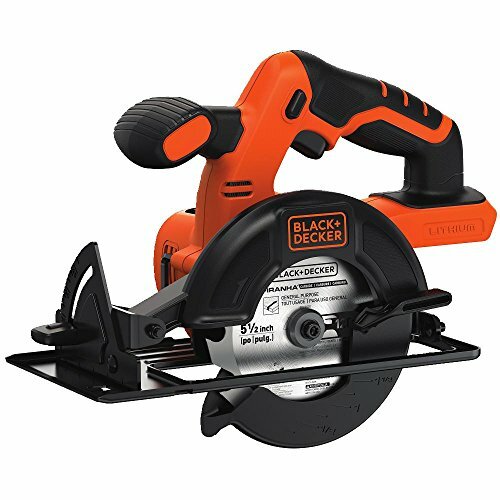 BLACK+DECKER BDCCS20B Circular Saw Sidewinder 5-1/2” Check on Amazon! A mid-grade circular saw it is the best circular saw for moderate to small projects, this is a cordless saw offering up to 460 max watts out and up to 5150 rpm from the motor. It can cut with ease and features a magnesium shoe for accuracy and durability. It is part of the brand’s 20v MAX Lithium-ion lineup and allows multiple devices to use the powerful batteries. The blade has a 0 to 50-degree bevel capability and uses a 6 ½” carbide tipped blade to allow for double times the usual material. This model rates high for its electronic brake that brings the blade to a halt almost immediately after the trigger is released. The design of this circular saw is also ergonomic with rubber comfort grips and a battery position that keeps things balanced and lighter in weight (7 pounds). Comfortable handles ensure little fatigue. One of the highest performers in the list, it is the best circular saw for the professional as well as the avid DIY enthusiast. With this cord-powered saw and 15 amps of power (and a dual-field motor), it can rip through even the most challenging materials. The worm drive design is meant to keep weight down, too, reducing fatigue. However, it still weighs more than 11 pounds. Getting the cuts required, with precision, is easier than ever thanks to the range of 0 to 45-degree stops. It also features the Cut Ready depth system along with magnesium components to make cutting easy and consistent. The anti-snag guard also ensures smoother cuts. A cutting capacity of 2-3/8 inch at 90° means that even challenging cuts and angles can be easily tackled with the 7 ¼” blade. The ergonomic, soft-grip handles also add to the comfort of this circular saw. If you are a hobbyist, this is the lightweight saw you’ve been seeking. As the best circular saw for smaller, household jobs, it is a lightweight option (less than seven pounds) with lots of excellent features. With a laser guide that ensures razor-straight cuts, it is the perfect starter saw for the first-time buyer. With a lower than average price, it features some premium options such as the sawdust removal system that ensures the cutting surface is clear. It has a 14 amp motor with 5300 rpm, which means it does make fast cuts. The 7 ¼” carbide tipped blade has a spindle lock feature for quick changes, and a variety of cuts are possible with the 51-degree bevel. The ergonomic handle ensures control and less fatigue, too. Among the lighter weight circular saws, at just under nine pounds, it is a remarkably high-quality tool. Very compact and portable with a 10’ cord, it is able to rip even challenging materials. A 15 amp, Dual-Field motor promises 5,300 RPM yet remains cool. A right-sided sidewinder with a 7 ¼” blade, it is the best circular saw for optimal visibility along with comfortable gripping and balance. Most users approve of its design because they will not have to take a leaning stance to see over the blade. And fitted with a dust blower, this circular saw eliminates the common issue of sawdust accumulation and blocked lines of sight. The 56-degree bevel with stops at 0 degrees and 45 degrees give optimal flexibility. An investment item, this well-designed, hypoid model circular saw is meant to last for years to come. It is the best circular saw for both the expert and the novice as it delivers great cutting capability along with reliable and stable performance. The 7 ¼” blade is easily adjustable thanks to the large side levers that set depth and angle. The hypoid design also means more surface contact, further supporting cut control. Plus, the overall design (including a sealed gearbox) means lower demands for upkeep and maintenance. A 15 amp motor that delivers up to 4500 rpm, it can bevel from 0 up to 51.5 degrees and offers positive stops at 45 degrees. And blade changes are remarkably simple due to the push button spindle lock. A smaller circular saw, it is nonetheless powerful. 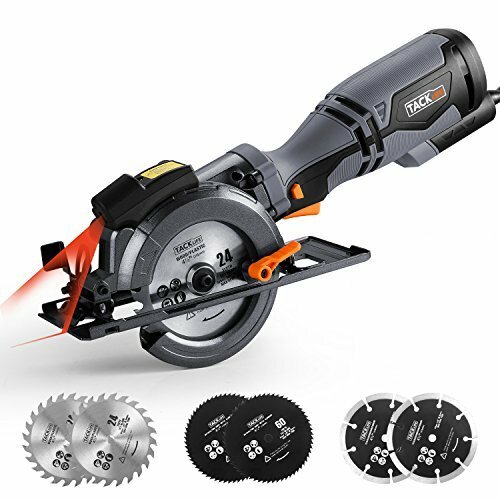 Able to bite through wood, tile, metal and pipes, it would be the best circular saw for a professional or busy home improvement enthusiast. It is a lightweight, even though it offers a powerful 15 amp motor with a surprising 5800 rpm. A centrifugal fan and baffle system adds a touch of innovation and ensures the motor remains cool under even the greatest challenges. You can even switch from AC to DC when alternative power is available. It also delivers a surprisingly variable cutting capacity with up to 2 3/8” at 90 degrees and up to 1 ¾” at 45 degrees on the 7 ¼” blade. A low guard helps with narrower and beveled cut accuracy, but it also features LED lights that highlight the line of cut. Unlike many in the list, this model features a dust blower to help you nail your line of cut without repeatedly stopping to remove sawdust and buildup. If you have room in your budget and toolbox for two circular saws, this unique and flexible saw from TACKLIFE should be one of them. With a design that allows single hand use, it still delivers reliable and strong cuts. Adjust or even disassemble with a single move of the handle! A laser guide promises lots of support with even difficult cuts, and the 5.8 amp motor delivers up to 3500 rpm to make it easier than ever to get through plastic, wood, tile, pipe and more. The six different blades (ranging from 4-3/4″ & 4-1/2”) include one for wood, another for soft metal, one for tile, and more. With the different blades, you also get easy to set bevels and depts that offer 1 11/16” at 90 degrees and 1 3/8” at 45 degrees. With safe switches and ergonomic design and lighter weight (around eight pounds), it is a compact or “mini” style with an integrated safety button required to cue the motor. This sidewinder brings the Makita reputation along with it but bumps things up a notch by offering a larger 10 ¼” blade that grinds through four times the lumber of a regular blade. A 15 amp motor comes with 4300 rpm and ensures your saw can get through even engineered lumber. This means it is a good choice for the professional as well as the experienced DIY expert. Weighing in at over 15 pounds, though, it runs the risk of boosting fatigue, but the ergonomic design brings a huge amount of balance, and the front and top handles have been engineered for maximum control and comfort. With dual front and rear bevel supports, accuracy is assured, but the flat motor housing is also another element of the saw’s stability. Of course, the cutting capabilities with of 3 3/16” at 90 degrees and 2 11/16” at 45 degrees deliver a tremendous amount of flexibility, too. They adjust on the fly with large, rubberized levers that make bevel and depth adjustments a breeze. This is one of the heaviest duty circular saws in the list and is ideal for the avid amateur and the skilled professional. With a 15 amp motor that delivers 5500 RPM, it slices through even the most difficult materials with easy. Yet, it weighs only nine pounds, making it far lighter than other, comparable models. It can deliver 2.5” cuts at a 90 degree and up to 1 7/8” at 45 degrees. With its carbide tipped blade at a generous 7 ¼” you get clean work whether using the 55-degree max bevel, the presets (22.5 and 45 degrees), or any other settings. Meant to work, it has a spindle lock and depth adjustments that can be adjusted immediately. Corded rather than battery operated, it includes an auxiliary handle to guarantee a good line of sight and metal upper and lower guards to deliver true durability. As its name implies, this circular saw is a left bladed sidewinder that helps to ensure optimal visibility and more accurate cuts. It is an all magnesium unit that promises a longer life span, and with the dual field motor, it remains cool and also comes with longer engine life, too. With “best in class” torque it is a fast cutter using 15 amps and delivering 5300 rpm. It delivers 2 7/16” at 90 degrees and 1 7/8” at 45 degrees, with an extended 56-degree bevel for the widest range of cut options with its 7-1/4″ blade. An ergonomically designed circular saw, it is a delight for a left-handed user but is also designed to optimize the experience for a right-handed owner. The saw weighs in at less than nine pounds and relies on its unique guards to direct dust away from the user (much like a work drive model). A unique little standout from the rest of the list, this smaller cordless saw is a high performer and wins praise from all who use it. It is often compared to the DeWalt brand for its capabilities. It adapts to the same battery pack used in many other home-sized Black+Decker devices. The high torque motor is not up to heavy duty (i.e., professional work) but is more than satisfactory with almost any wooden materials. It is an ideal all-purpose trimming machine. Battery operated it is lighter in weight (six pounds) and uses a 5.5-inch blade that makes the saw easier to maneuver and handle with accuracy. This is a left-sided sidewinder that has been designed for enhanced line of sight, and as a remarkable boon to the left-handed DIY enthusiast. Bevel capacity is from 45 to 90 degrees, making it a flexible tool for most users as well as one of the best circular saws for the year. Now that you have a basic idea of the features of the top-rated circular saws for 2019, it is time to learn how to go about selecting a circular saw that meets your needs. Step one in choosing the best circular saw for your needs, apart from reading these circular saw reviews, is first to be honest with yourself about the way you intend to use the circular or electric saw. Additionally, you need to be realistic about your experience and skills with such a tool. If you are a novice, then it is best to choose one of the sidewinders we’ve identified above, and even work with one that uses laser guides to help with accurate cuts. Those that control dust and sawdust are also great for the beginner. If you are already well versed at the use of an electric saw and other power tools, then you can just narrow down the options based on things like style, power, and so on. Of course, even the most experienced folks may not know about the different types of saws and how they may have specific advantages over other styles. So, that’s where we will begin in our brief tutorial about identifying the best circular saws for your needs. Sidewinder or Inline – They can have their blades on the right or left side, and the rest of the saw’s weight is always set opposite the blade. So, a left-sided circular saw would have weight on the right side, and vice versa. Typically, this means that the weight of the saw sits on the side of the board that is NOT hanging into open space, i.e., behind the cut. Unfortunately, this can make it difficult to see where you are making the cut, which is why so many use an array of guides, including laser guides. The upside of the sidewinder is that your hands are far from the blade, and the sidewinders are usually thought to be safer, lighter and quite versatile. Worm Drive – This design always features the blade on the left side of the motor, meaning that the weight of a worm drive circular saw is on the right. This means that the way that the blade is installed leaves a clear line of sight to the cutting area, and you will always be able to see the entire cut as you are making it. A downside to the worm drive is that most circular saw owners are introduced to the equipment on a sidewinder design, and it does take a lot of adjustment to use the worm drive option safely. Yet, when you do get used to it, the style allows you to cut more wood, faster as they are usually more powerful than other styles in addition to being accurate. The downside is that they do not handle small cuts with any sort of ease or effectiveness. NOTE: Both the worm drive and hypoid are geared down, meaning slower blade speeds or RPM, but in exchange, the user gets more torque. Hypoid – These vary most widely in their gearing. The design of the gears are like cones and this allows the motor to be parallel with the blade. The advantage is that all of the power from the motor goes to the blade, translating to lower RPM, higher torque and greater strength. The blades are on the left side, and in many ways, they are similar to a worm drive. However, they are longer and heavier, as well as a bit louder. They are some of the best circular saws for professionals. They also demand almost no maintenance since they typically rely on sealed motor systems. Other – Mini saws are the most commonly seen “other” type, and they are not the best circular saws for heavier duty jobs but can be remarkably handy in a lot of different settings. Once you have determined what you’ll be doing with your circular saw, you will find it easier to choose the type. Typically, heavier duty users choose the hypoid, while it is a real toss up between worm and sidewinders for average users. If you want a lot of added features, you’ll want to avoid sidewinders, though, and consider a worm drive option. Cord or battery? This is not a minor issue. Though a cordless saw may deliver similar amounts of power as a corded model, that performance is not always assured. Of course, a cord that is shorter than ten feet can be a real impediment, even if power is assured. Cordless saws are the best circular saws for those who work where power supplies are not always available or safe – even with a heavy duty extension cord. Additionally, cordless or battery powered saws may be the best circular saws for cutting wood and little else. There are some that can cope with more challenging cuts, but generally speaking, they don’t often have enough power for anything beyond wood or lumber. Additionally, the life of the battery is not always assured, and so the use of a cordless may mean having a backup on hand for bigger projects. Corded saws are the best circular saws for all other materials in addition to wood and engineered lumber. They can usually work as a skill saw and get through metal, brick, tile and wood. They can work continuously without any concerns of diminished power or capability. The downside is that you may find yourself lugging long, heavy-duty extension cords around and always keeping a sharp eye that you don’t trip, cut or otherwise harm the cord. Now, this is power source, but not the kind of power output from the electric saw. For that, we have to turn attention to motors and their output. For the most part, the very best circular saws will put have 10 to 15 amp motors, and basic wood cutting usually doesn’t demand much more than that. Professional work, of course, will need more and if you are investing in a circular saw for a construction or other similar field, a 15 amp motor should be the bare minimum. The important thing here is that torque decline occurs only with battery powered circular saws. The risk of decreasing power is one of the trade-offs for the lighter weight and portability of the battery powered. So, start by looking at the amps, and use that against your intended usage of the saw (professional vs. DIY) to select your model. Essentially, you will see an average of 10 to 15 in the circular saw reviews above, making any of them suited to a DIY enthusiast or a professional. However, when the expected RPM measures were available, we listed them in the different circular saw reviews. Typically, you want more RPM as that means you get more power out of the saw and better cuts. Keep in mind, though, that some RPM listings were with the saw cutting an average material. If you cut dense and hard materials, you may not get that power. Another factor you need to consider is the material used to make the circular saw, especially the shoe or footplate. This is base of your circular saw, where it rests atop the material you cut. It is what you use to adjust the depth and bevel angle, and it is often noted as the part of the saw that will give out first (if the saw is poorly made). Sadly, it is also the area most likely to absorb the shock if you drop the circular saw. Even the best circular saws will sustain damage if dropped just once, and so you want the shoe to be made from a durable material. Magnesium – This will add to the overall price of the circular saw, but it is the strongest option for your base plate. An all magnesium saw is likely to be the most expensive, but also the strongest and lightest. Aluminum – This is a thicker and more durable option than steel, but it is not as rugged as magnesium. It is cast in the identical way of steel but tends to be a better choice. Steel – A cast metal, it is going to bend surprisingly easy, particularly if you drop the saw. While damages may be reparable, it is not always the case. It is best to avoid saws with steel shoes or base plates. You may also see some baseplates made of fiber-reinforced plastics, and these are actually almost as durable as magnesium and often deemed better than aluminum or steel! Generally speaking, the material and quality of the base plate is usually an indicator of the overall quality of the saw. When a manufacturer uses shoddy or less durable materials on the base plate or shoe, it is usually a good sign that the entire saw received the same treatment. You can see from our handy reference table that the average or most common size is going to be 7 ¼”. However, there were also odd sizes like the mini saw’s 4 ¾” blade option, a circular saw sporting a 10 ¼” blade and even one with a 6 1/2” blade. Which should you choose? As odd as it might seem, you can only expect a lot from a blade if it is paired with the right motor. For example, you might be doing a lot of cutting on materials of similar thicknesses, and think that a 10 ¼” blade is a good choice. It is, but only if that blade is partnered with a motor offering adequate horsepower to get through the thicker or harder materials. So, simply be aware of your intended use of the circular saw, and choose a blade and motor combo that will make it work. The adjustability of a blade simply means your option for changing the depth of the cut as well as the angle or “bevel”. The best circular saws are going to offer a standard 2 ½” cut (as do all of the circular saws reviews above indicate). However, they can go as deep as 2 ¾”. The circular saw reviews also indicated when a saw could adjust from the stock 90 degrees to a bevel as low as 20 degrees or 45 degrees. These factors are crucial and you always want saws that can have a 0-degree maximum cutting depth and at least 45 degrees of a bevel. This ensures you cut precise bangles or miters. Don’t turn down one of the best circular saws because it is not capable of fine-tuned miters. Instead, purchase an actual miter saw that is designed for the full range and oddest combinations. Keep in mind, though, that the size and adjustability of any blade can be ruined or impaired by the wrong kind of blade, or a lower quality blade. The type of blade varies based on what a manufacturer supplies as the stock blade. You saw in the circular saw reviews that many of the saws came with a carbide tipped blade. These are “high-speed steel” blades that are enhanced with teeth that are strengthened with titanium carbide or tungsten. This makes them capable of getting through hard or engineered wood with greater ease. We also did some circular saw reviews of options with high-speed steel and even a variety of blades. Keep in mind that a saw that arrives with a masonry blade or a tile cutting blade needs the power to affect the best cuts. Most manufacturers supply high speed or carbide tipped options. Many readers may wonder why we included the weights of the best circular saws in the circular saw reviews. To put it plainly – the heavier the saw, the less amount of force the user must apply. We did explain that motor power and blade type has a lot to do with it, but so too does the weight of the saw. While a heavier saw makes lighter work of difficult materials, lifting a 14 pound saw for hours on end can become a very difficult task. If you are not already in the right physical condition to hoist a heavy saw into place repeatedly, you will want to consider a powerful, but lighter weight option, like one of the seven or eight-pound circular saws. As we noted in some of the circular saw reviews, not all of the saws came with electric braking. This is something that halts blade rotation in as little as two seconds. It is not an essential, but we strongly urge you to make it a serious consideration whether you are an expert with circular saws or a first-time owner. Additionally, it is often deemed both easier and safer to have a saw with a laser guide. This projects on to the material and helps you with accurate cuts, but it is also a feature that can keep you a bit safer by making the cutting path clearer and more obvious. Choosing the right or best circular saw for your needs begins with that one simple consideration: What will I be doing with this saw? Once you are clear about the kind of materials, the number of materials, and the level of experience you have with circular saws, it makes it easier to use what you have learned here to select the right option. Keep in mind, there is nothing wrong with purchasing a lightweight “introductory” model or even doubling up, such as having that unique hand-held circular saw along with a more traditional model. The goal of owning any circular saw is to make your life easier and get good results. With all that you have learned here, you should be able to choose the best models for projects of any kind or any level of experience.